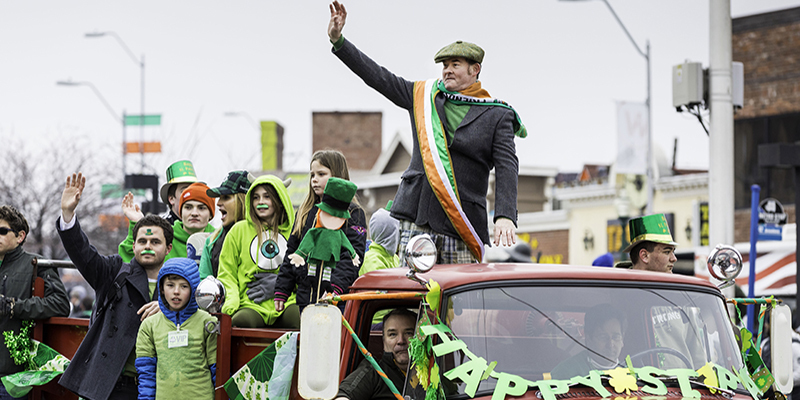 Leprechauns stroll alongside marching bands and elaborate floats in morning parades while in the afternoon, green beverages line bar tops at local watering holes throughout the city. Wherever you look there’s a party to be had, no matter the time of day or day of the week. 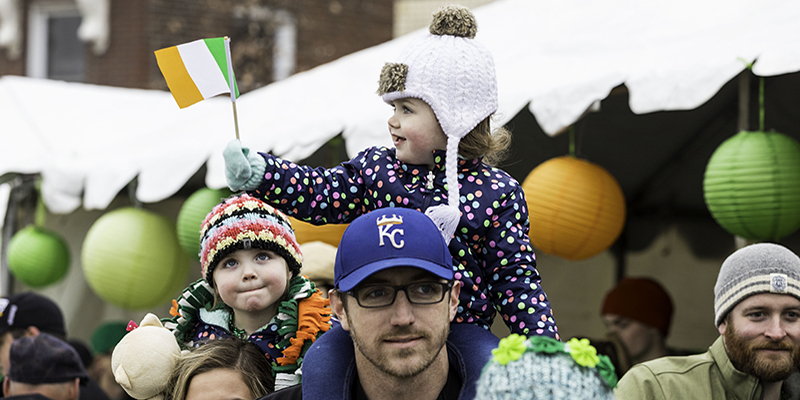 It’s St. Patrick’s Day season in Kansas City: part celebration of the city’s rich Irish heritage, part full day of fun for many in the metro. 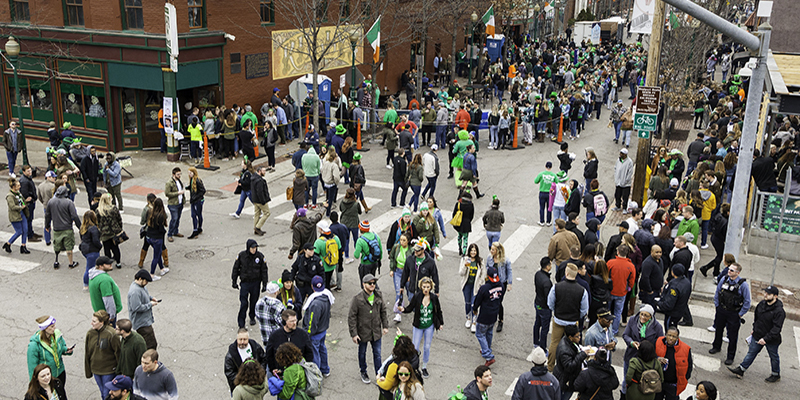 Kansas City’s Irish roots date back to the mid-1800s, when immigrants lent their expertise and labor to help shape the rocky terrain of Westport and Independence into the metro we know today. These settlers brought their customs across the Atlantic Ocean as well, including music, dance, food and yes, St. Patrick’s Day. 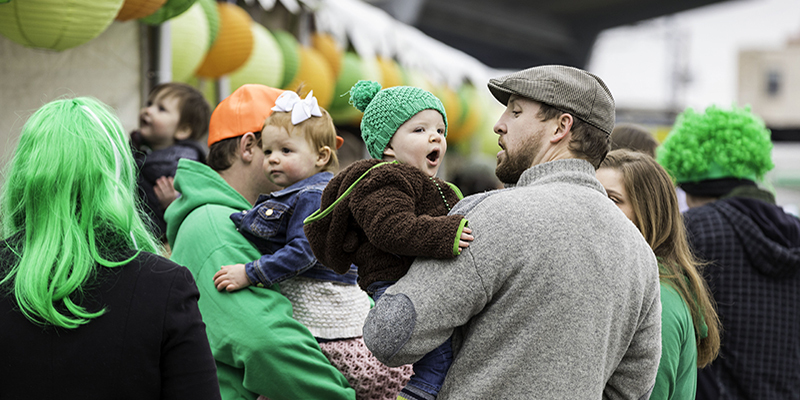 Today, the Celtic culture continues to be a proud KC institution, with regional cuisine and establishments promoting Irish heritage while organizations like the Kansas City Irish Center preserve and celebrate the strong connection between the Emerald Isle and KC. 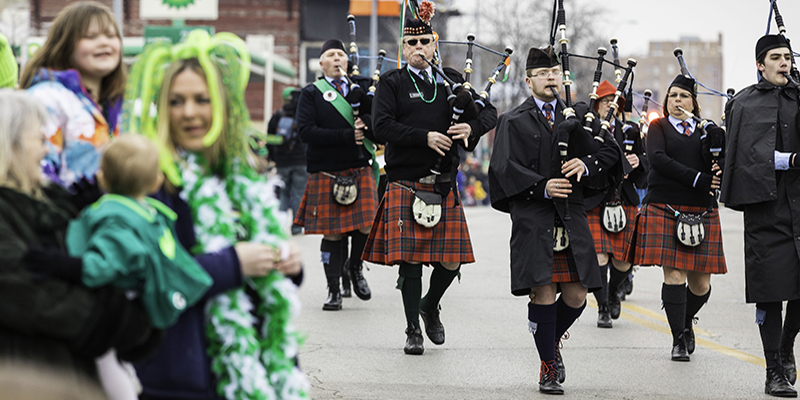 One of the most popular parades in the city takes place during this beloved holiday, as thousands gather to cheer at the Kansas City St. Patrick's Day Parade, which begins at Linwood & Broadway and proceeds south along Broadway to 43rd Street, finishing in KC's Westport district. Other parades flood the streets in Blue Springs, Leavenworth and Lawrence, just to name a few. 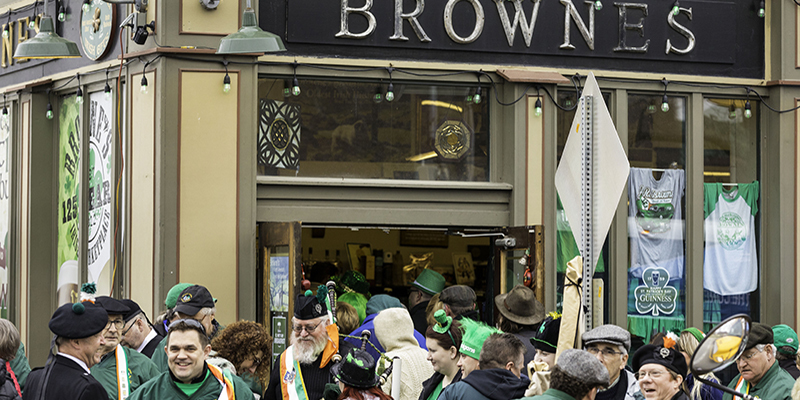 Afterwards, drop by Browne’s Irish Marketplace, the oldest Irish-owned business in North America, for a bite of traditional fare. Or, if you’re up in Weston, visit Celtic Ranch for Irish clothing, jewelry, whiskey and more. As many likely know, St. Patrick’s Day tends to be a holiday for adults. However, Kansas City hosts plenty of family-friendly events so that everyone can enjoy the holiday. 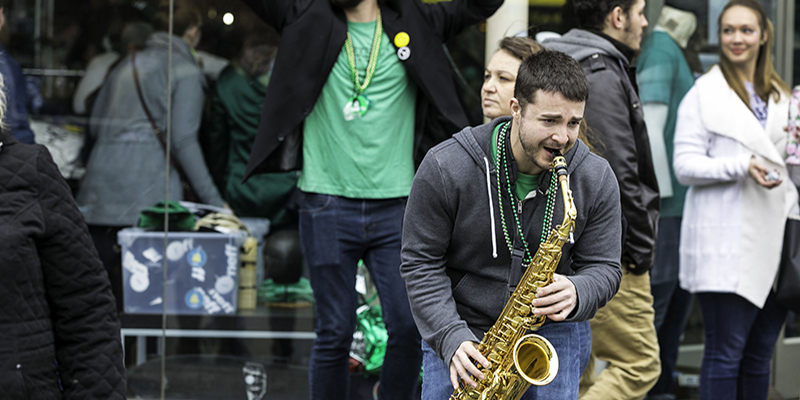 Parades are the most predominant pastime, with the Snake Saturday Parade kicking festivities off in North Kansas City the weekend before St. Paddy’s. The two-day tradition includes a cook-off, carnival and more kids’ activities, and has raised more than $1 million for charity in its 33-year history. Just south, Westport hosts an annual 4-mile run that many treat as a warmup before an Irish breakfast at one of the local establishments. Young ones can also get in on the fun by running the Little Shamrock Run, a 3-block dash through the neighborhood. Kelly’s Westport Inn – A perennial favorite, Kelly’s may just be the most iconic Irish bar in all of Kansas City (it’s been serving guests in green since 1947). The Dubliner – Entrenched in the Power & Light District, this Dublin-style tavern is at the center of the action during big-time events in the city, plus regular Irish performers. McFadden’s Sports Saloon – Filled with fun crowds and plenty of TVs, this Power & Light District establishment makes for the perfect hangout. 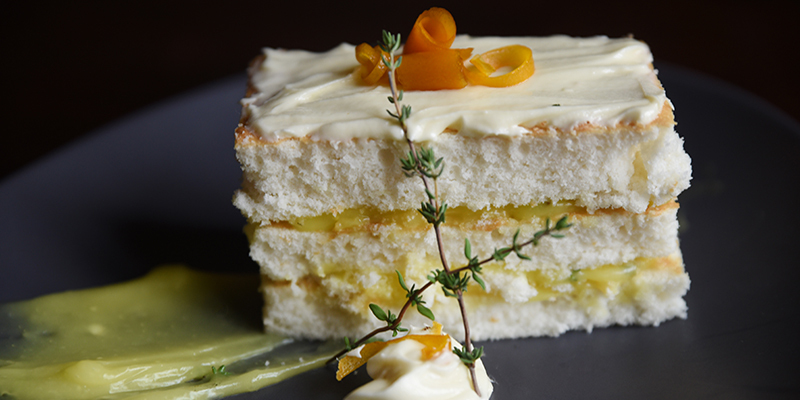 O’Dowd’s – This Country Club Plaza gastrobar features live music, a revamped, authentic cuisine and craft spirits. Paddy O’Quigley’s – If you can’t make it downtown this St. Patrick’s Day, head to Leawood for a bite and a pint at this neighborhood pub. O’Malley’s 1842 Pub – Located just north of KC in Weston, Mo., the historic, multi-level O’Malley’s is home to raucous live performances, festivals and good times for all. Flowers are in bloom and the weather is warm. Between a brisk morning hike in the wilderness and an afternoon on the patio with a cold drink in your hands, your days are filled with heading from one adventure to the next, or simply doing nothing at all—and loving every minute of it. It’s springtime in KC. From craft beer festivals to holiday lightings and everything in between, mark your calendar with some of Kansas City's largest and most unique happenings on tap for the year. From grand cascading centerpieces situated prominently along the city’s major thoroughfares to petite spouting statuary in quaint residential neighborhoods, each fountain represents a unique contribution to KC’s timeless moniker, the City of Fountains.